Huntington Station, NY (April 7, 2019) – Last night, around 9:00 p.m., police were called to the scene of a pedestrian accident that led to critical injuries in one individual. Police have not yet identified the pedestrian or the driver. The unidentified pedestrian was attempting to cross the street at New York Avenue last night when he was suddenly struck by the driver of a Honda CRV. After the accident, it was determined that the pedestrian suffered critical injuries and he was airlifted to the Stony Brook University Medical Center. The driver, who was not injured, was identified only as a 52-year-old man from Brooklyn. No charges have been filed and the investigation into the matter continues. First and foremost, we would like to take this time to extend our sincerest thoughts and prayers to the victim involved in this accident, with the hopes that they receive a speedy and smooth recovery. Pedestrian accidents tend to be some of the most life-changing accidents that take place on our roads. Pedestrians are extremely vulnerable to serious injuries due to the fact that they lack protection from harm on our roads. If you have been injured in a pedestrian accident in New York, seek the help of an experienced attorney during this challenging time. Our accident attorneys at Hach & Rose are prepared to stand by your side and protect your rights during this difficult time. 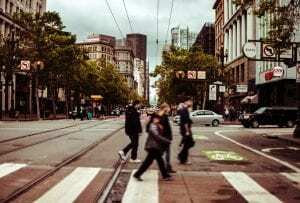 We understand that, if you are someone who has received injuries in a serious pedestrian accident, you have rights to various types of compensation. Please contact us for more information today at 212-779-0057.